FORT LAUDERDALE, Fla. - A Broward Sheriff's Office deputy who was suspended with pay earlier this year for allegedly leaking video of a shooting at Fort Lauderdale-Hollywood International Airport to TMZ was arrested Wednesday. 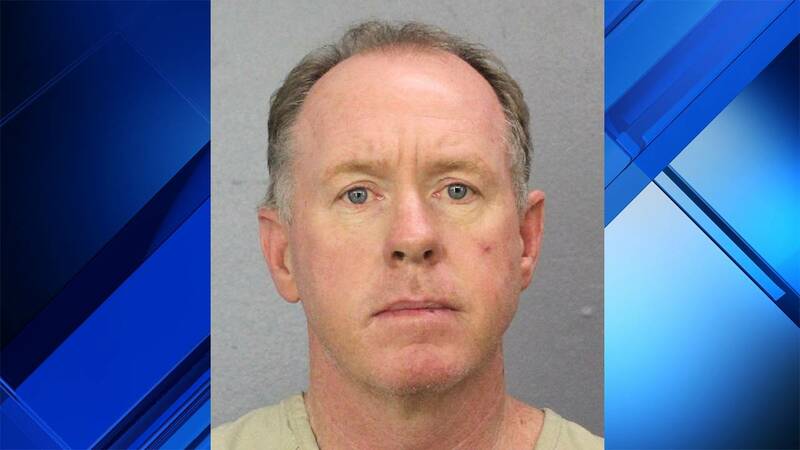 Michael Dingman, 47, turned himself in at his employer's headquarters Wednesday morning and was taken to the main jail, the Sun Sentinel first reported. "When I found out that a video had been released and that a suspect was one of our very own, I was very angry," Broward County Sheriff Scott Israel said Wednesday at a news conference. Dingman is accused of secretly recording security footage that shows a gunman firing at random Jan. 6 in the baggage claim area of Terminal 2. The suspected gunman has been identified as Esteban Santiago, 26, who remains behind bars. Authorities said Dingman, who worked at the airport and was described as a high-ranking law enforcement officer with security clearance, used a cellphone to record off of a monitor, not realizing that part of his own reflection was captured on the footage that was likely sold to TMZ. The images that authorities said showed Dingman's reflection were turned over to the FBI. According to an arrest warrant, two sergeants and two deputies, including Dingman, viewed the surveillance video inside one of the sergeant's office. The sergeant told investigators that he remembered that Dingman had his cellphone out while they were reviewing the footage, but he did not notice whether Dingman was recording. The report stated that Dingman told a detective, "Do you guys think I made money on this thing? Because if so, I didn't. You can search my bank records if you'd like, but you aren't going to find anything." Investigators found that Dingman had engaged in several phone calls with people from TMZ and had also contacted other media outlets, the arrest warrant stated. The warrant also stated that Dingman had searched TMZ on his agency-issued computer just four hours before the video appeared on TMZ's website. During the investigation, detectives said Dingman willingly turned over his agency-issued computer and vehicle, but told a detective that he was advised by his attorney not to turn over his cellphone without a warrant because it was akin to "giving you (investigators) the keys to the kingdom." Dingman faces charges of tampering with or fabricating physical evidence, using a two-way communication device to facilitate a felony, using a public record to commit a crime and violating public records law. Dingman's status with BSO changed Tuesday to suspended without pay while Internal Affairs investigates accusations of disclosing confidential criminal justice information, failing to use discretion and conduct that is unbecoming of an employee.